After an enemy rune is destroyed, you gain 3 health. Dawnstar Healer is an epic Willpower creature card. It is part of the Core Set. "They won't get past me!" "You like to dance close to the fire, don't you?" "I've got skulls to crack!" The card is named for the Skyrim town of Dawnstar. 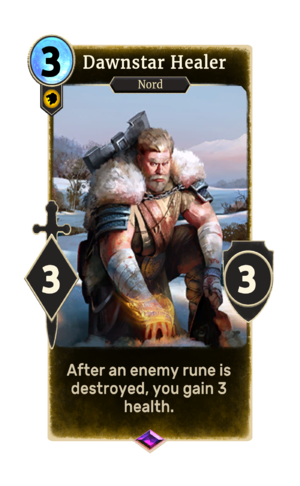 Prior to July 2017 and Update 65.2, the card's ability read "When an enemy rune is destroyed, you gain 3 health." This was changed to allow more interactivity with runes and prophecies. This page was last modified on 15 February 2019, at 11:55.